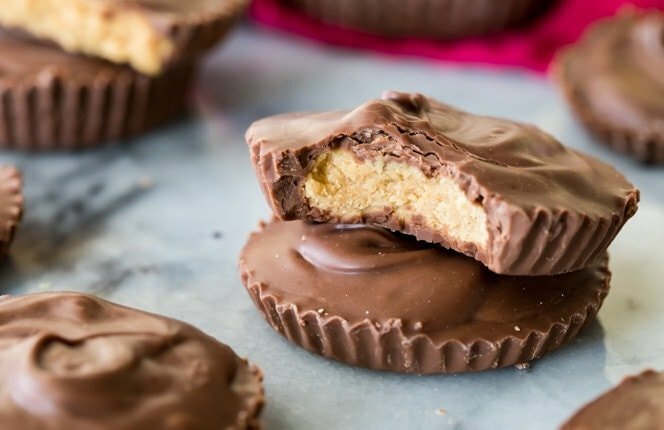 Make your own homemade peanut butter cups and you’ll never go back to the store-bought kind again! 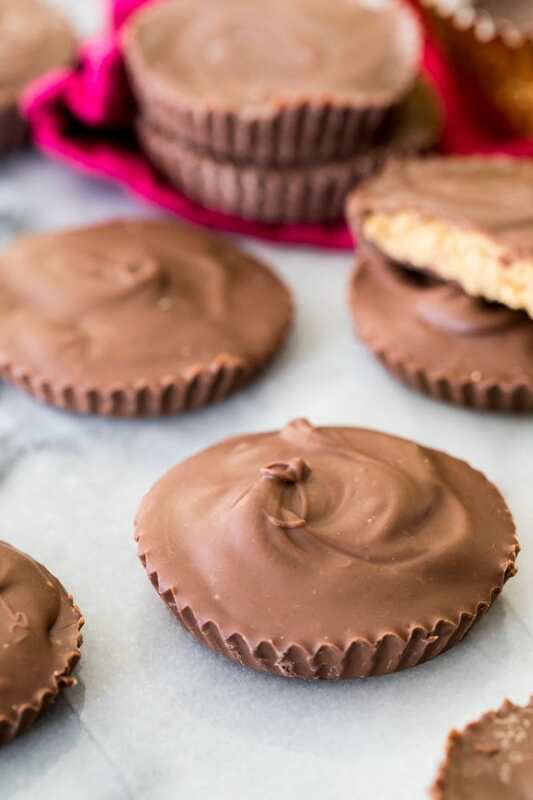 These easy candy cups get their signature ridges from being molded in cupcake liners and are made with creamy milk chocolate (though you can certainly use dark instead) and a smooth and simple peanut butter filling (no graham cracker crumbs here!). Try them out for yourself and see how easy they are to make! It’s been 13 days since I last shared a peanut butter and chocolate recipe with you, so I think we’re about due for a new one, right? The filling is very similar to the one that I use for my buckeye recipe and my peanut butter bars, and you might notice that in both that recipe and in this one I don’t use graham cracker crumbs while many other recipes do. Personally, I don’t like the graham cracker crumbs, though I tried this recipe using them several times (Zach also voted no on the crumbs). I think they make the filling much too gritty and chewy when it should be smooth and the flavor of the peanut butter should be the highlighting feature, not the awkward texture of the cracker crumb. Take care when melting your chocolate. Chocolate should always be melted slowly, so when microwaving your chocolate chips don’t heat the chocolate for longer than 25 seconds at a time and stir very well in between heating. You want to heat until it is just melted — if the chocolate gets too hot it can leave streaks in your peanut butter cups when finished baking, or even worse it will seize and become completely unusable. I also recommend adding a teaspoon of shortening to the chocolate chips while melting to make the chocolate smoother and easier to spread into the cupcake liners once cooled. Use the right tools to make the process as easy and neat as possible. Making peanut butter cups can be a pretty messy process. To keep things as neat as possible, I used a 2-teaspoon cookie dough scoop (affiliate) to distribute my chocolate into the liners and used a small pastry brush to evenly coat the bottom of each liner with chocolate. I also cover my entire surface that I’ll be working on with wax paper, so that any spills can be easily cleaned up once I’m finished. I also recommend placing your cupcake liners on a cookie sheet before filling with chocolate and peanut butter. Once you’ve filled the liners, they will be hard to move without messing them up until they’ve set, so make things easy for yourself by putting them on a cookie sheet that you can move without mis-shaping your peanut butter cups. 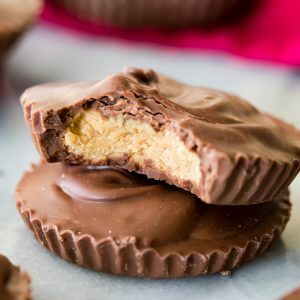 These peanut butter cups usually require at least an hour for the chocolate to re-solidify so that you can easily separate them from their cupcake liners. If you wish to speed up the process you can place them in the refrigerator to harden faster, but this can cause some discoloration in your chocolate (it will still taste good, though!). 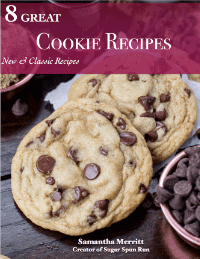 Looking for more peanut butter & chocolate recipes? Check out my peanut butter blossoms or my peanut butter thumbprint cookies! 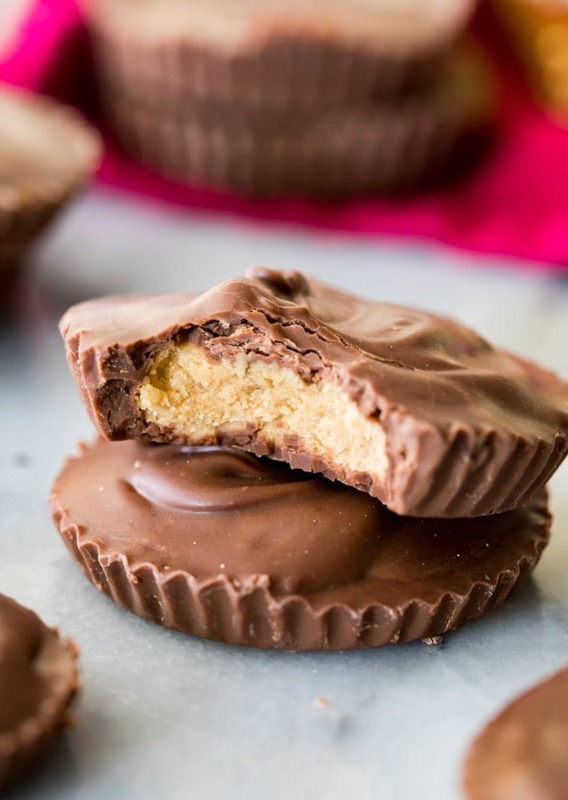 How to make homemade peanut butter cups. You will need cupcake liners for this recipe. Combine peanut butter and butter in a medium-sized bowl and use an electric mixer to beat together until well-combined. Roll about 2-3 teaspoons of your peanut butter mixture into a ball, slightly flatten, and set aside on a wax paper lined cookie sheet (if the peanut butter mixture is too sticky to handle, add more powdered sugar, stirring in 1 Tablespoon at a time until it is manageable). Set out 20 cupcake liners on a large cookie sheet. Prepare your chocolate by combining the chocolate chips and shortening in a large, microwave-safe bowl and microwaving in 25-second increments (stirring well between each) until chocolate is completely melted. Spoon a small amount (about 2 teaspoons) of chocolate into a cupcake liner and use the back of a small spoon or use a pastry brush to spread the chocolate so the entire bottom of the liner is covered. Press a prepared peanut butter ball gently into the chocolate layer, and then spoon additional chocolate on top until all of the peanut butter is completely covered in chocolate. Allow cupcake liners to sit undisturbed until the chocolate has hardened (this may take over an hour), or you may speed up the process and place the cups in the fridge for at least 30 minutes. 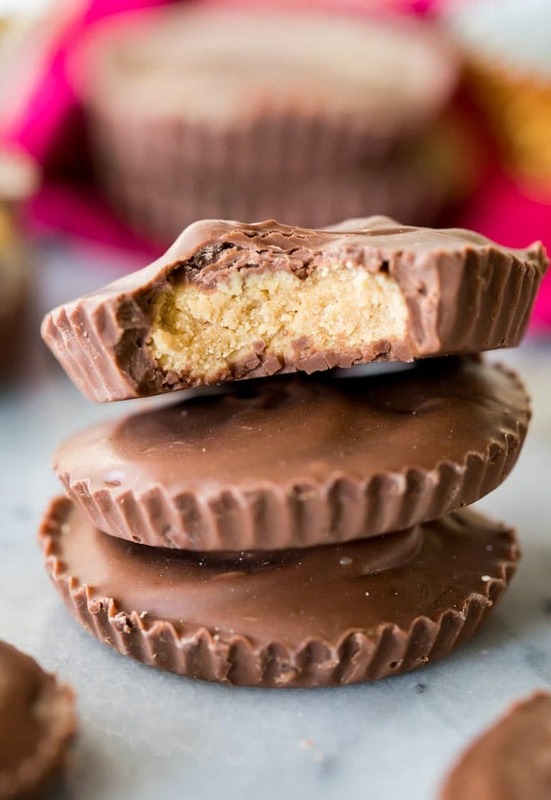 Best peanut butter cup recipe out there. I agree that the graham cracker style does not add anything. Really glad I found your recipe! Thanks! they are good we love em eish!!!!!!!!!!!!!!!!!!!!!!!!!!!!!!!!!!!! !